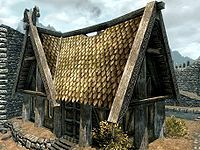 Carlotta Valentia's House is a house in the Wind District of Whiterun, where Carlotta Valentia lives with her daughter Mila. The house is next door to House of Clan Battle-Born, opposite Amren's House, it is split into four rooms and two floors. It contains only one zone, Carlotta Valentia's House. * This person only sells goods at the market. It is in the southwestern corner of the Wind District, the first house on the left after ascending the steps to the left of the main gate. There is a lavender bush by the house at the top of the stairs from the Plain's District. The door is nearly always locked with a novice level lock. The first room serves as both kitchen and dining room, the main feature is the fire pit in the middle of the floor with a cooking pot over it. Hanging above the fire is a rack holding three garlic braids, three bunches of elves ear, two salmon and a rabbit. To the right of the door are two chairs next to a small table with two honey nut treats and a cabbage on top, beside the table against the east wall are some small shelves with candles, a loaf of bread and cups on them. On the north wall there are some wall shelves holding some general household kitchen items, and on a set of shelves in the north-western corner are three bottles of ale, a couple of pieces of goat cheese, a leather strip, and several food sacks, with some more sacks leaning against the west wall. 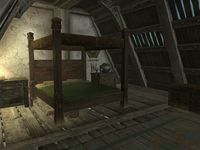 The next room is the living room, on a bench to the left, against the east wall is a copy of A Gentleman's Guide to Whiterun, written by Mikael, another resident of Whiterun and involved in Carlotta's quest. Above the bench is a wall shelf holding a copy of Of Crossed Daggers and household items. There are three chairs by a small table in the northwestern corner, which is sometimes used for eating meals at, with a portion of grilled leeks, a red apple and a bottle of wine. Above the table are two shelves with a joint of raw beef, a loaf of bread, a bowl of red apples and general items. The cupboard in the south-western corner holds two leeks, plates, cups and other general items. There is also a narrow table under the stairs holding three bulbs of garlic in a bowl and some food sacks. Under the stairs is the door to Mila's bedroom, it contains a single owned child's bed in the northwest corner, beside which is an end table holding a long taffy treat and a eidar cheese wedge. At the foot of the bed is a sack and on a square wooden table with two chairs in the southeast corner is a copy of Kolb & the Dragon and a sweet roll. At the top of the stairs and above Mila's bedroom is a small landing with two chairs a low table and a cupboard containing a couple of common books. Carlotta's bedroom is to the north and consists of a lage four-poster double bed with an end table on either side against the north wall. On the right-hand end table is a potion of minor healing. On the floor to the left of the bed is a copy of the Enchanting skill book Enchanter's Primer. Against the south wall is a tall wardrobe containing clothes, with a chair beside it. Under the eaves to the east is an unlocked non-respawning chest containing gold and to the right is a round wooden table and chair. On the table is another potion of minor healing, a sweet roll and a bowl of tomatoes. Carlotta rises at 8am and leaves immediately for her stall, and Mila rises at 9am and also leaves without eating breakfast. They do not return home during the day. Mila returns at 9pm to eat dinner and then goes to bed and Carlotta will return at 11pm after spending a few hours in the Bannered Mare after closing her stall. She goes straight to bed and they both stay in bed until the morning, when they rise to resume their daily activities. The key to Carlotta Valentia's House is carried by Carlotta. There is a Loot shadowmark on the bottom right-hand corner of the building. Completing Carlotta's quest A Few Words with You makes low value items freely available, and also the use of Carlotta's double bed, but not Mila's. This page was last modified on 31 July 2017, at 01:58.